On the bulletin board where announcements are posted, you’ll see the lost and found list. As the name suggests, campers update the list about belongings they have lost or found while at camp. Sometimes the list gets pretty specific (“If anyone sees a sock that is blue with cooked pink shrimp on it, please return it to Middler 6!”), and we read the list aloud frequently to make sure that girls return with everything they came here with. When the list was read today, though, there wasn’t anything on the lost list. In fact, there were only items on the found list. I thought this was beautifully poetic—it represented the ways in which the community was looking out for each other, even before anyone realized they had lost something. In many ways, this idea seeps into our everyday lives at camp. In coming to camp, we lose things, or more accurately, are without things. We have the basics in our trunk: a flashlight, a book, some clothes, and some friendship bracelet string, but we are without some of the more present items of our existence: our phones, our computers, the familiar environments we are used to. 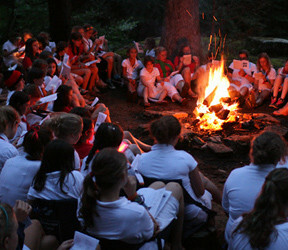 Yet girls come back every year, and daydream about camp all throughout the year. I think that is because they have found so much more at camp than they have lost. They find strength in them that they never knew was there before, they find that they have a lot in common with people from different backgrounds, they find the capacity in them to be giving and authentic—the found list is much longer than the lost list. Throughout camp, the exchange between lost and found is seen every day. 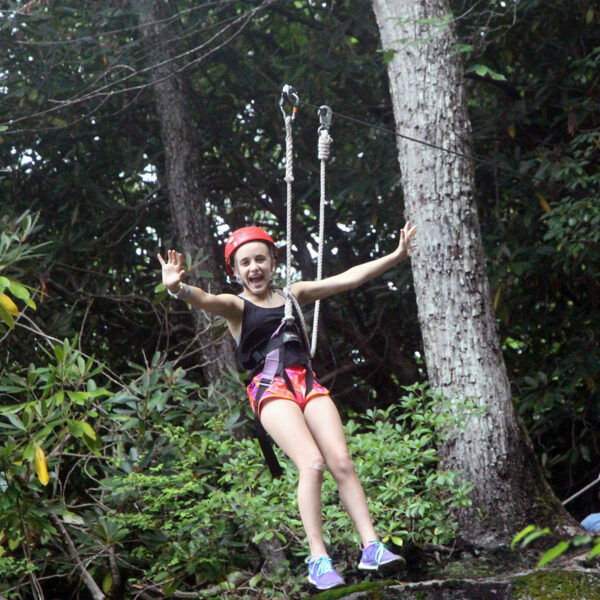 Today, it was announced that there was going to be a zip-lining trip. 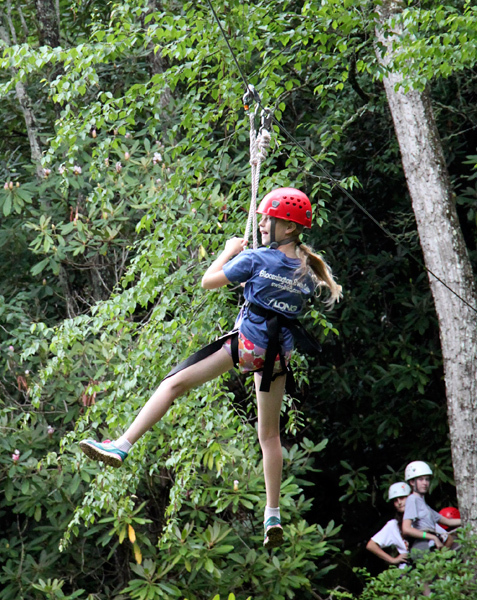 The zip-line goes throughout the back side of camp, taking girls across waterfalls and through the trees. 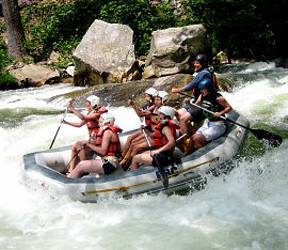 This trip is generally offered multiple times every day, and is always wildly popular. As this was the first activity day for many girls, today was a particularly popular day to sign up for the trip. Because the trip was so popular, it was impossible to get everyone who wanted to go today on the trip (they’ll definitely have more opportunities to go, though!). A trio of juniors who arrived yesterday were all in line for the trip. When two of them drew cards that meant that they could go, but one of them could not go, the two who were chosen to go on the trip gave up their spaces, saying that they would go another time when their friend could go. This beautifully exemplified this lost and found principle. Even though they lost going on the trip today, they found a way for them all to go together another time. More than that, though, they found a deeper sense of friendship and the joy that comes from being a loyal friend and the maturity that comes with compromising one’s own bliss for the good of others. They gained much more than they lost. 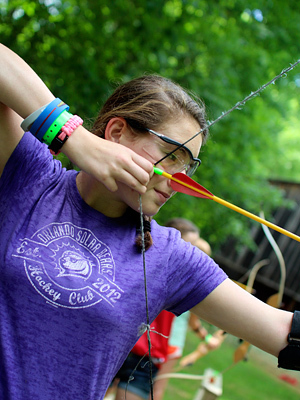 At camp, we see this in other ways too. Sometimes, what we lose is not as tangible as a sock or even a zip-line experience. A lot of the time, it’s our inhibitions and the things that prevent us from having fun and being our true selves. The other day, we were having an evening program called “Jug Band.” Jug Band is an old-fashioned campfire that incorporates Appalachian culture and silliness. Everyone brings an “instrument” (like rocks or brooms) and sings songs such as “Mountain Dew” and “Wagon Wheel.” Jug Band is incredibly fun, but is also incredibly silly. On the night of Jug Band, a middler cabin lacked their usual enthusiasm for the event. They were hesitant about going, and did not want to dress up. Their counselors, however, started playing on instruments (trunks and tennis rackets) and making up songs. Before long, the entire cabin was joining in the fun, creating their own band! By the time they showed up to Jug Band, they were some of the most enthusiastic and spirited campers at the fire. In their cabin, the band kept practicing and writing new songs. The band’s name was “Saurkraut,” (the spelling is intentional) and tonight during twilight, Saurkraut had their first performance. They created tickets that they handed out to everyone (some of the tickets were even autographed: ‘Saurkraut! Rock out!’) and one of their hit songs was “Do You Jam, Bro?” The band was a hit, and the reviews were raving, “That’s the best thing that’s ever happened at twilight!” When inhibitions were lost, Saurkraut was found. Creativity, a greater sense of community, identity, and the ability to let our hair down—these are the things we find here at camp. 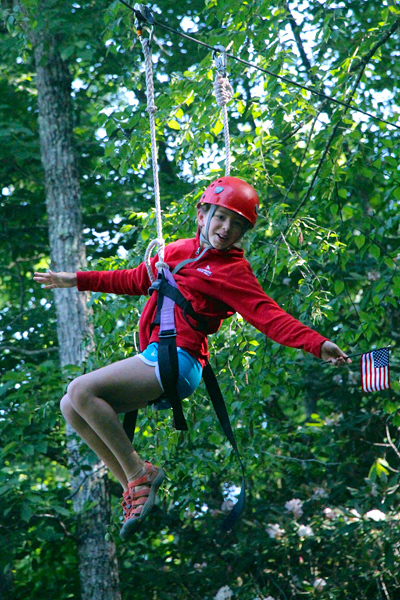 The other thing about lost and found at camp is that we learn to live without the things we have lost. We realize we can live without that sock, that we can thrive without our phones. But when things are found, we gain a new appreciation for them. We want to keep what we’ve found safe, we know it in an entirely different way. I think that’s how the intangibles at camp work, too. We find this authentic version of ourselves, someone who knows how to compromise and get along with others, who seeks the best in others, who isn’t afraid to get her hair wet. When we go home, we have a new appreciation for this version of ourselves, and we live differently, as we continue to stay found. 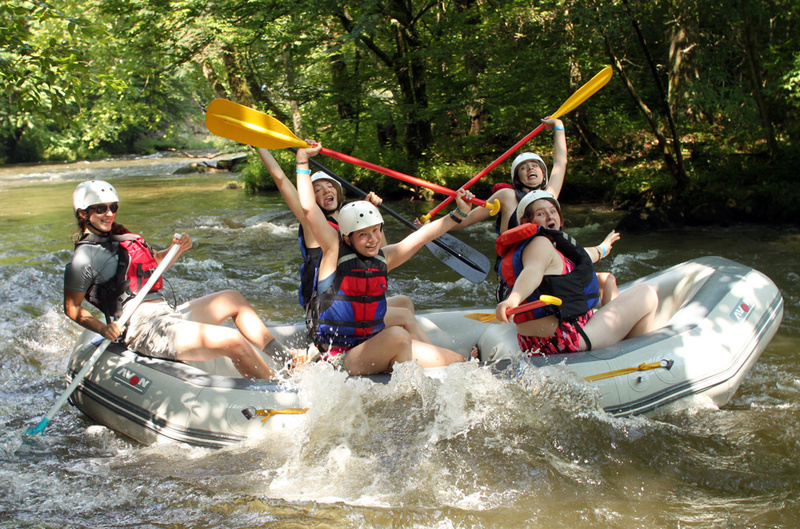 About once a week we head over to the Nantahala River for whitewater rafting, like today, when two groups of Middlers and Seniors made the 2-hour run down the river. 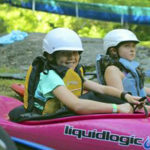 Being the only girls summer camp that has a permit to run these trips (The US Forest Service issued us the permit back in the early 1980s), we decided long ago to make rafting a big part of our adventure program. We don’t charge extra for the trips and we let everyone who’s old enough (Middlers and Seniors, in our case) sign up to go if they like. 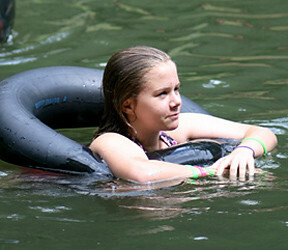 All of this has made rafting very popular with Rockbrook girls, with about 90% of them choosing to raft every summer. For many, it’s their favorite adventure trip out of camp. 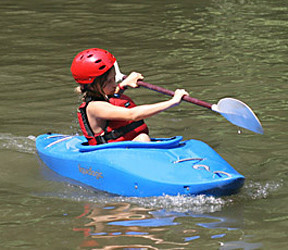 Rockbrook really is “that rafting camp,” as one person put it. 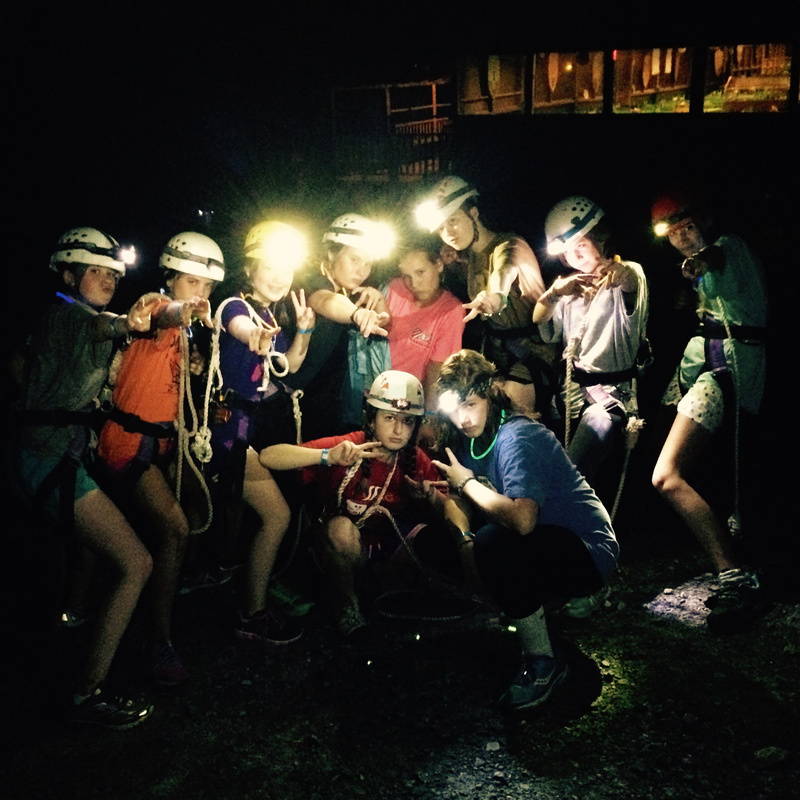 Last night we also gave the girls the option to spend the night at our outpost camp before their rafting trip. Over in Macon County and adjoining the Nantahala National Forest, Rockbrook acquired and improved this unique piece of property with camping shelters (simple screened, structures), a small bath house, and a dining hall where we can have our meals. It’s a great place, “out in the middle of nowhere,” literally “at the end of the road,” where we can enjoy camping only 15 minutes from the river. It’s a beautiful place too. We had a wonderful time together last night singing songs around the campfire, making s’mores, and listening to the nighttime calls of a nearby whippoorwill. 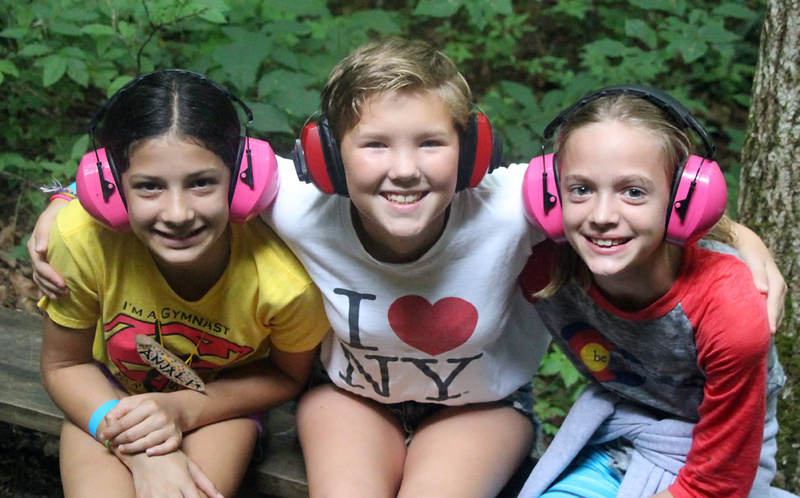 I was impressed by how relaxed and happy all the girls were as they spent their time together on the overnight, particularly because the group was made up of a few teenagers as well as young girls who had just finished 5th grade. There wasn’t one person trying to be cool, or exclusive. Instead, they all happily hung out together, slept in the same shelter together, sang songs and laughed at each others jokes. This showed me that these girls really trust each other, and that despite their age differences, really like each other too. 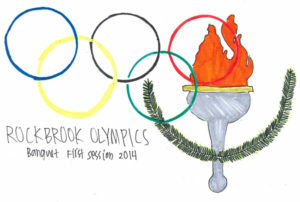 It was a remarkable expression of “Rockbrook Spirit” that would make you proud to witness. 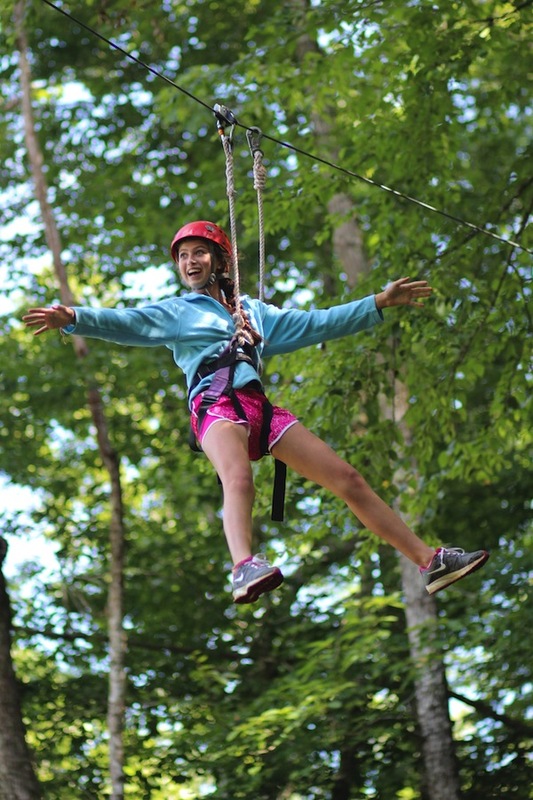 There is another adventure activity popular with the girls at camp— we run it almost everyday —and it’s unique because of Rockbrook’s topography: our zip line course. Instead of zips and bridges going from platform to platform suspended in trees like most zipline “canopy tours,” our 3 ziplines (2 of which are new this summer) and 3 bridges (2 new ones here too) are suspended between gigantic boulders. The cables are bolted directly into solid rock making them extraordinarily strong anchor points for each span. 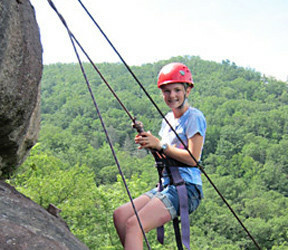 The first zip is especially cool; it begins high to the right of “Stick Biscuit Falls,” the 50-ft waterfall directly above the camp, and slowly passes you across the front the falls, about 80 feet in the air, as you slide along the cable to a rock face on the far side. 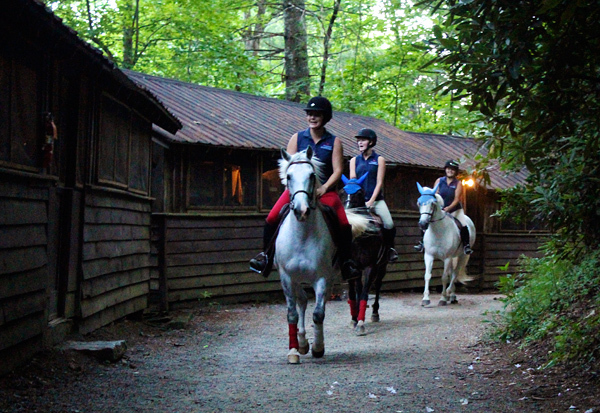 The next 150-ft zip begins at another boulder and sends riders over a gulley below, filled with rhododendron and mountain laurel. 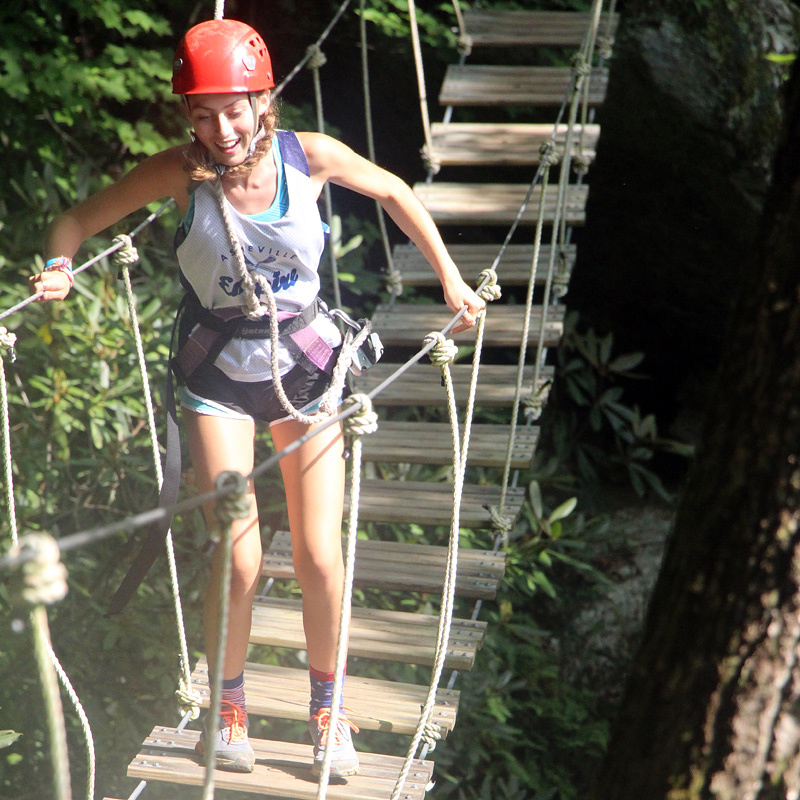 From there the riders make their way across the 3 swinging bridges: a beam, cable, and platform bridge. 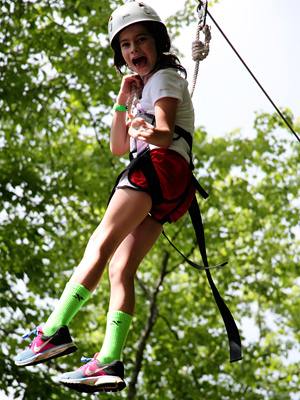 The final zip is a screaming 450-ft ride all the way back to camp. It takes a group of eight campers about an hour to complete every thrill of the course. 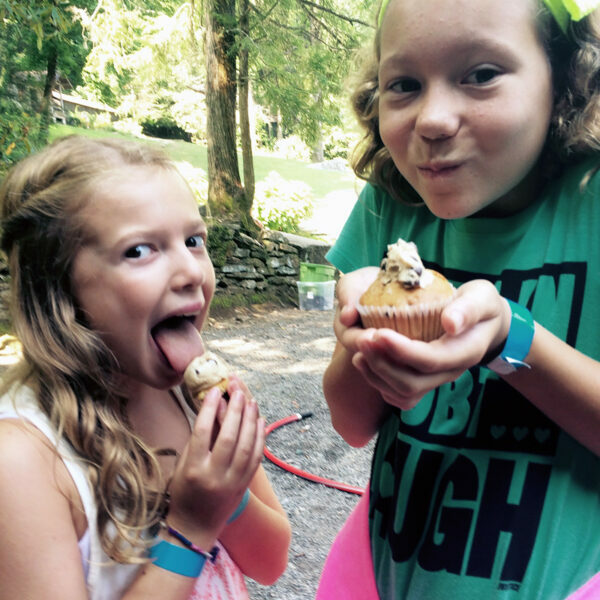 The same thing happened this morning when the girls discovered that the Rockbrook baker had added some edge to today’s muffin flavor: “chocolate chip cookie dough.” You might be wondering how to make a “dough” muffin? You first bake a chocolate chip muffin, but then serve it with a blob of cookie dough on top. An outrageous topping, I know, but also, oh so good. They really were something else. I heard from several girls, in fact, that this was their new favorite muffin flavor. We’re off to a fantastic start of the session. 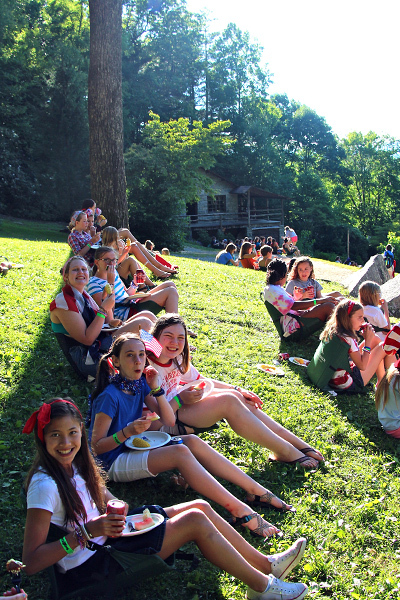 With this many really wonderful girls at camp, it’s no surprise. 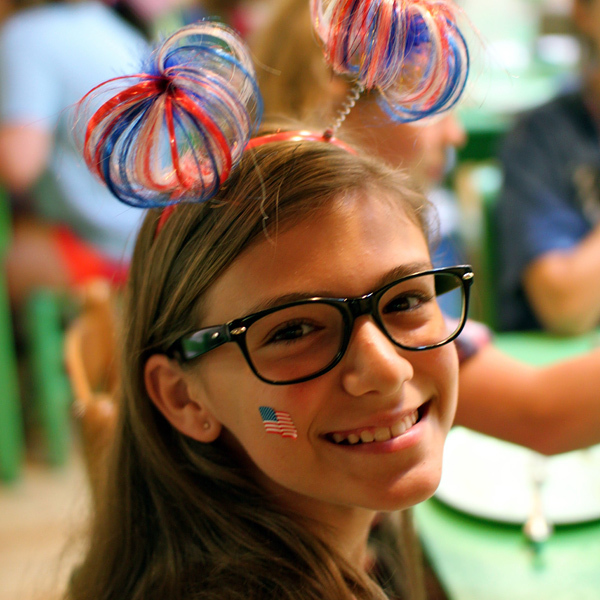 On a day like this, you know what to wear… anything and everything red, white and blue. 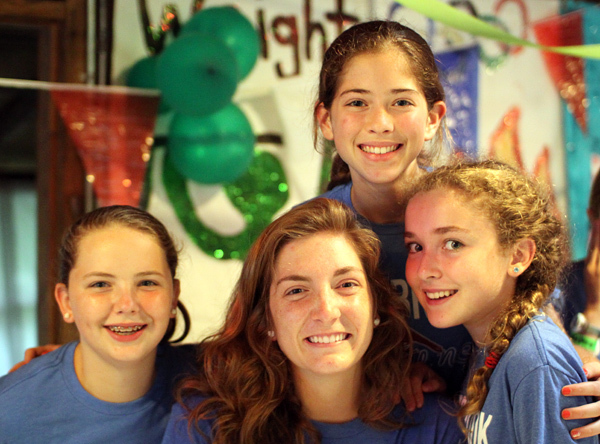 Last night a group of counselors stayed up late and decorated the dining hall with streamers, balloons, table decorations and flags. 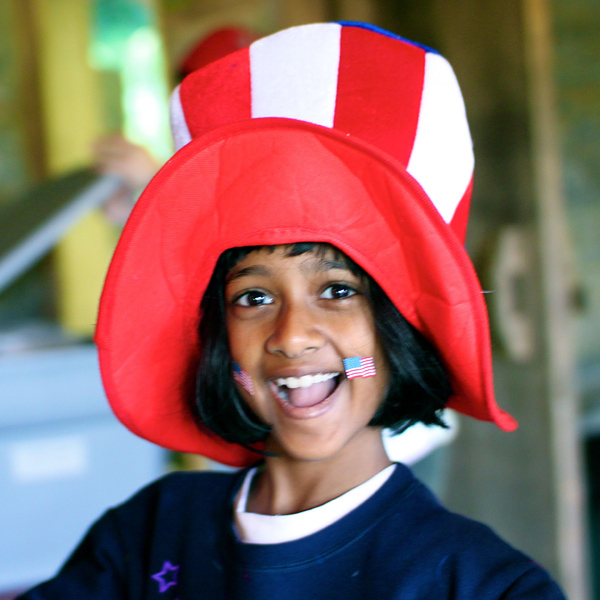 Also a surprise for the campers, we had red, white and blue hats, headbands, temporary tattoos and bead necklaces on the tables for everyone to embellish their own costumes, and boost their patriotic spirit. In the dining hall, for both breakfast and lunch, the girls couldn’t help but further express their enthusiasm for the holiday by singing songs like “You’re a Grand Old Flag,” “Firework,” and Yankee Doodle Dandy.” At one point a whole cabin stopped eating to yell “Happy Birthday America!” followed by cheers from everyone else. These girls do have spirit! 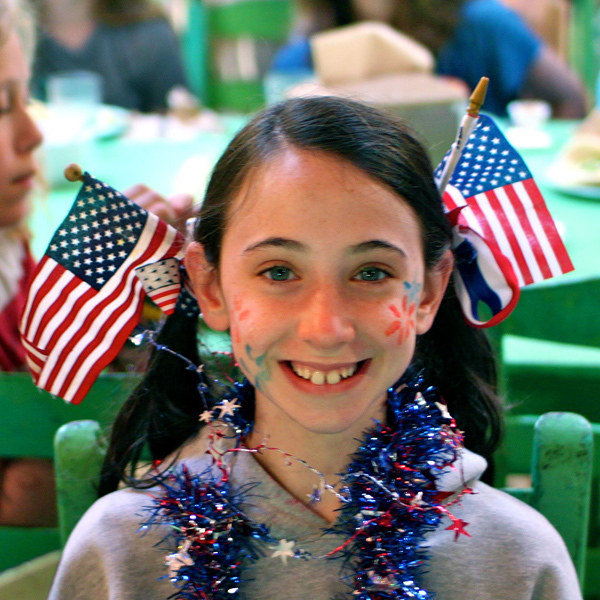 A tour of the camp activities this morning proved this spirit was high everywhere, with patriotic decorations being more normal than not. 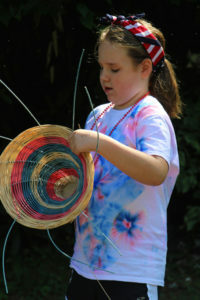 For example, at the creek by the Curosty cabin, Melanie and the girls were weaving red, white and blue baskets. Feet soaking in the creek with the reeds and plenty of sunshine brightening the scene, the girls produced some really cool baskets. 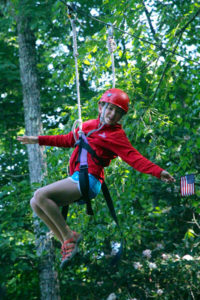 At the zipline, Rita brought along small flags for the girls to wave as they flew down the cable. Zip after zip, the blur of red, white and blue was spectacular to see. 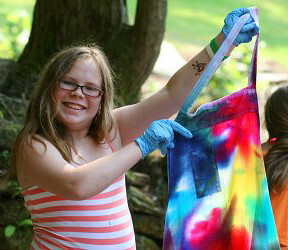 Over in Hodge Podge, the girls were likewise leaning pretty heavily on 4th of July colors for their tie dye t-shirt designs. Following Rest Hour, we continued this theme with everyone joining in for an afternoon of group relays down on our grassy sports field. 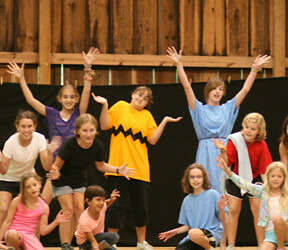 We first divided all the campers and counselors, mixing the Lines, into three groups. 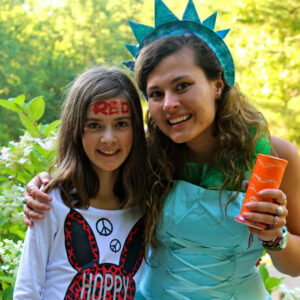 Each took a color— yes, again red, white or blue —and using tempera body paint and the how they dressed, built a unified team, complete with a rallying chant or cheer. Split like this, the camp made up three teams of approximately 95 people. Once assembled on the field, again with simply superb weather, Chase and Grace organized at least a dozen different relay races matching representatives from each team. While 10 or so girls from each team competed in a relay, the others cheered them on. It was exciting to watch classic relays like the 3-legged race, the egg (on a spoon) carry, and the crab walk. 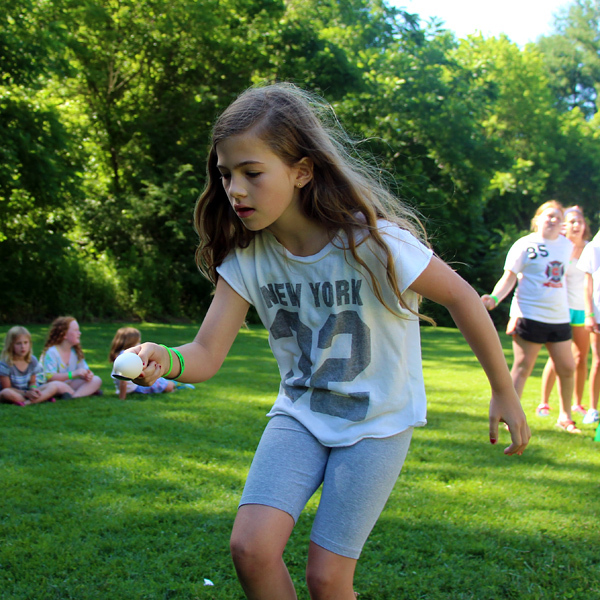 We also had teams square off for an egg toss, a water balloon toss, and a cracker eating race. Other groups raced across the field carrying an orange under their chins, and others carrying a water-soaked sponge trying to fill up a bucket. Interestingly, even though these were races, and it was very exciting for your team to win a particular relay, nobody paid much attention to the overall score. In the end, who “won” seemed irrelevant to the girls. I think they were having too much fun to worry about that sort of thing. Finally, all that racing around warmed us up enough to make the final surprise feel really great. Richie borrowed a fire truck from his Volunteer Fire Department and using the water cannon, created the largest sprinkler you’ve ever seen. He shot a spray of water about 40 feet in the air so the girls could run around and shower off a bit under it. Dinner tonight, taking great advantage of our huge charcoal grill, started with hamburgers, hotdogs and grilled chicken, plus homemade coleslaw, corn on the cob and freshly sliced watermelon loading down our plates. 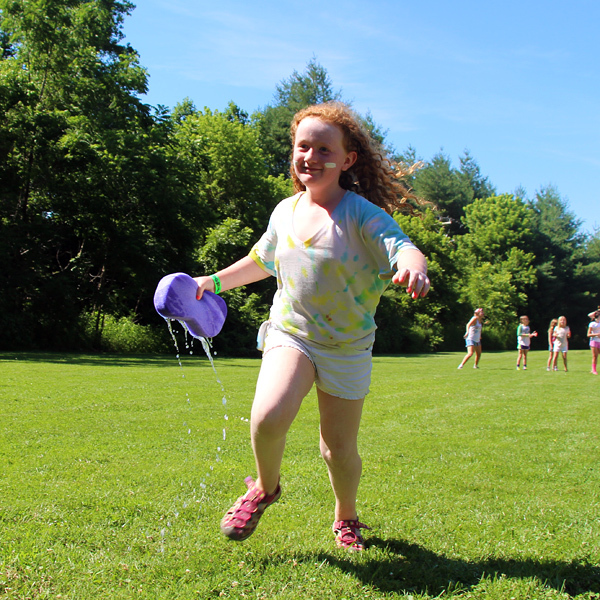 Then, tapping into another camp tradition, the girls also enjoyed a cold soda that was chilled in the stream. 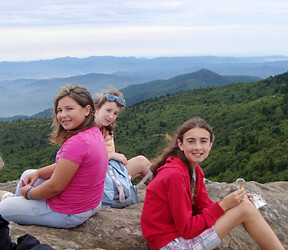 The hill in the center of camp makes the perfect place for an evening picnic as it slopes to present a view of the Blue Ridge Mountains. Topping off the meal, Katie (with some help from the Hi-Ups) made us all patriotic cupcakes— red, white and blue, each with a tiny American Flag stuck in the top. It was such a nice evening together… great food, perfect weather, fun music playing, and so many of our very best friends. 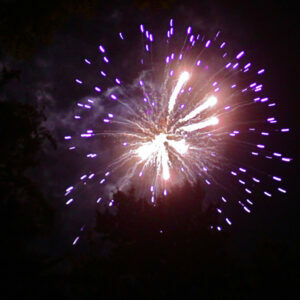 As night fell, anticipation grew for our fireworks show, the finale of the day. All the girls and their counselors pulled out crazy creek chairs on the hill so they could have a view of the sky above the lake where we launch everything. 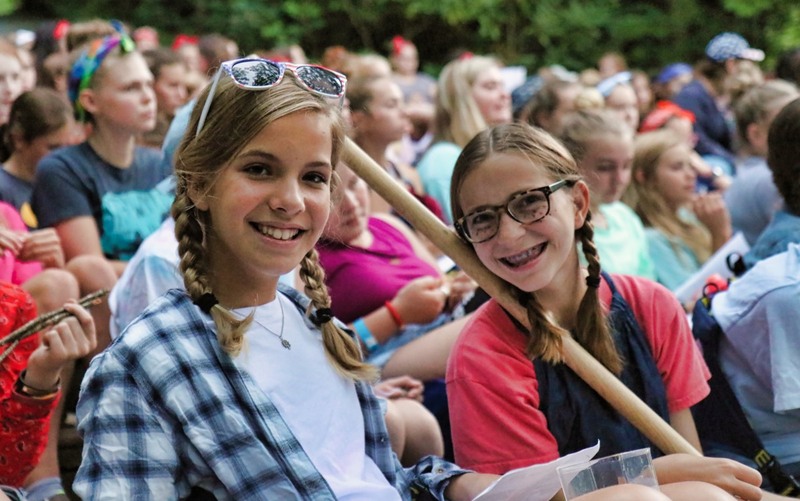 Armed with flashlights and glow sticks, and bopping along to the upbeat music Stephanie and Chase had selected, the girls cheered after every colorful blast. This has been one of the best 4th of July celebrations at camp in recent memory. So great in fact, it’s hard to think of a way that it could have been any better. 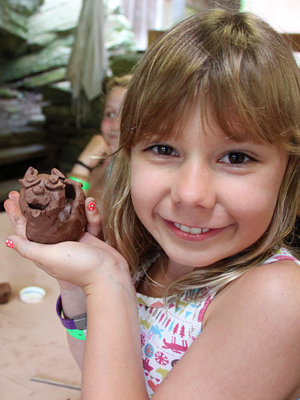 Throughout the session, over the last few weeks, the girls have had their hands deep in clay making all sorts of small sculptures, decorative tiles, vessels like cups and bowls, and just about anything they can imagine. Both pottery studios were almost like factories with campers producing incredibly varied forms, works of art really, from the uniformly brown clay. 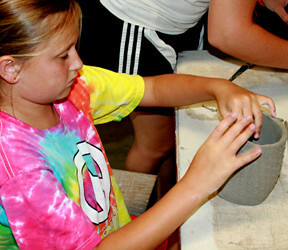 More recently over the last few days, everyone took the next step of carefully painting glazes on their pottery pieces. The glazes paint on in dull-looking colors, but after the final step— firing in a kiln —they take on the shiny, more vibrant color you expect. Last Night Michelle, the director of our Ceramics Program, fired two completely stacked kilns containing all the work of the campers. That’s an almost 24 hour process, with the temperature slowly rising (to drive out any lingering moisture) and then holding at 1940 degrees for almost 12 hours. It’s very exciting to open the kilns after all that time and heat, and to see how the pieces ultimately turned out. 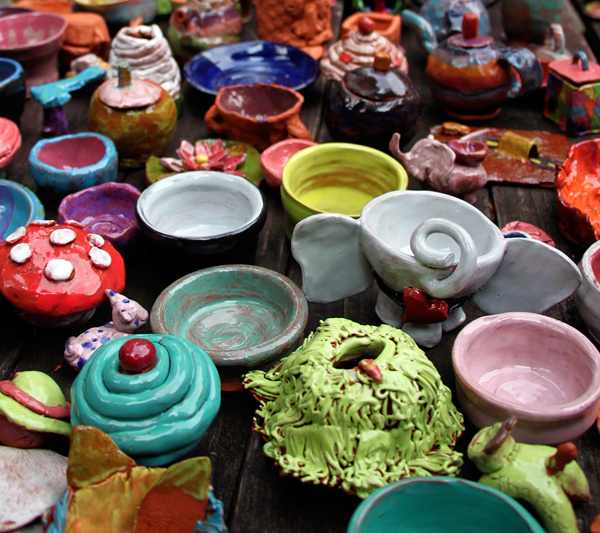 This morning Michelle unloaded the kilns and set out all the finished pottery so the girls could claim their work. Such a colorful exhibit! Tonight was something everyone in camp was looking forward to, our end of session banquet. 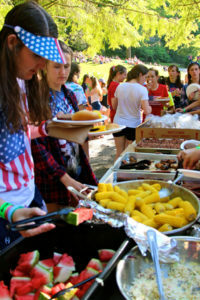 Based on a theme kept secret from everyone except the CA girls who planned every aspect of the event (costumes, music, decoration, food, skits, and choreographed dance numbers), the banquet is a fantastic party thrown for the entire camp. 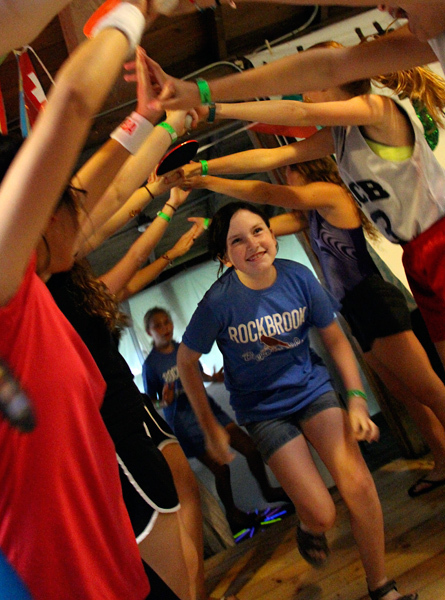 The CA campers spend all day decorating the dining hall, again in secret, until the theme is finally revealed as the campers enter through a tunnel of arms. 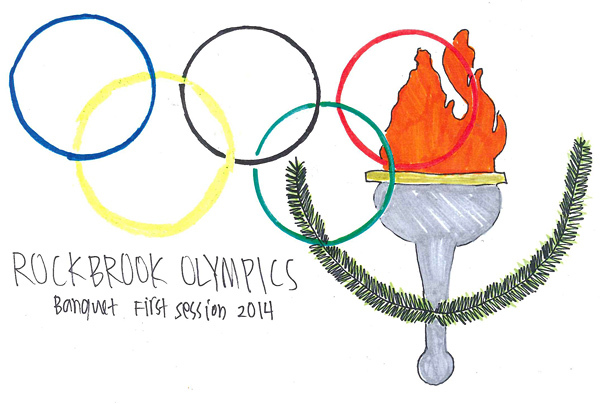 Our banquet theme for this session… The “Rockbrook Olympics!” The CAs created a festive international party with posters of Olympic sports, flags of countries from around the world, streamers, balloons, and table decorations highlighting different countries and sports. They built an awards podium, and presented a synchronized swimming routine, a boxing dance number, as well as opening and closing ceremonies, complete with an Olympic torch. They served “Olympic Onion Rings” “Misty May’s Mixed Vegetables,” “Gold Medal Chicken Nuggets,” and “Shawn Johnson Strawberries.” Through the dinner, as the girls nibbled on all the different courses of food and enjoyed the candy also decorating the tables, they had dance breaks, spontaneously jumping up to dance in the cleared center area. The girls and staff members, all dressed in their blue RBC t-shirts, seemed so happy, laughing and dancing, pausing now and then for a quick photo. The banquet was a wonderful mix of fun dancing and food, colorful decorations and entertainment, but most of all, an upbeat celebration among now very close friends. These girls know how to enjoy themselves! The first full day of the session, as was today, means several things. First, it’s a chance for the campers to become more familiar with the property and activity areas, to get a better sense of where everything is located. Following their camp tour yesterday, now they venture off on their own to the Alpine climbing tower, the Hillside Lodge for yoga, or Curosty for weaving, for example. There are almost 30 different things to do— organized activities available during the scheduled activity periods —and each has a “home” somewhere in camp. 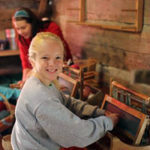 Imagine all the little pockets of activity spread around Rockbrook… Outdoor adventure instructors explaining how to use special equipment, arts and crafts teachers introducing cool sewing, pottery, or weaving projects, horses being tacked up, bows and arrows nocked. If you scan through today’s photo gallery, you can see the variety of things going on. These girls are impressive already! What’s even more impressive though, and probably more significant in the long run, is the independence this first day of camp has already brought about in your girls. Remember, at Rockbrook, the campers select their own activities while at camp. Often after much discussion with friends about the options, and “what are you gonna take?” kinds of questions, everyone selects 4 different activities they will try for the first half of the week. 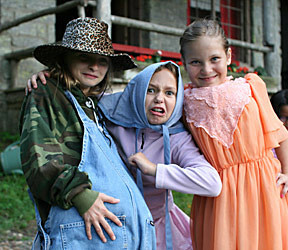 For each activity rotation, which happens twice per week, the girls themselves decide how to spend their activity time. 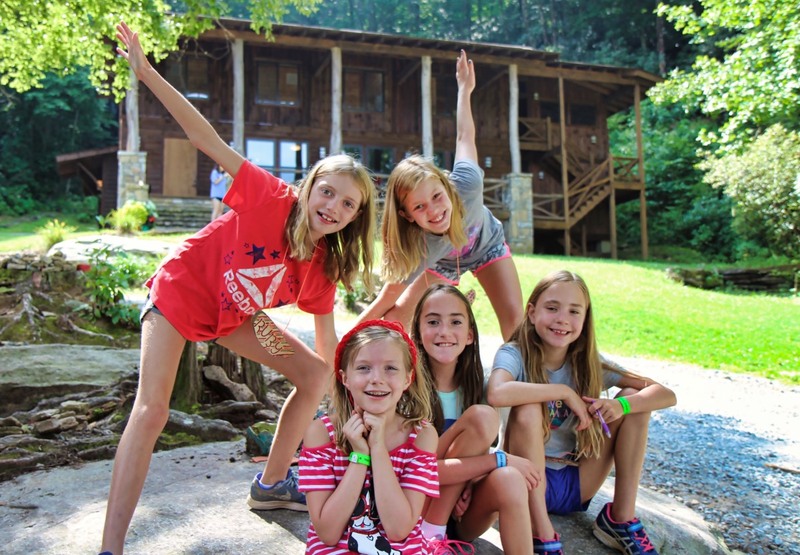 Furthermore, during the blocks of free time scheduled throughout the day— before lunch, before dinner, and after dinner —the campers can decide to do even more independent things. With a friend, they might head to the lake for a ride down the water slide, go to the tennis courts to hit a few balls, challenge someone at the tetherball court, or just hang out on the grassy hill enjoying the mountain view. 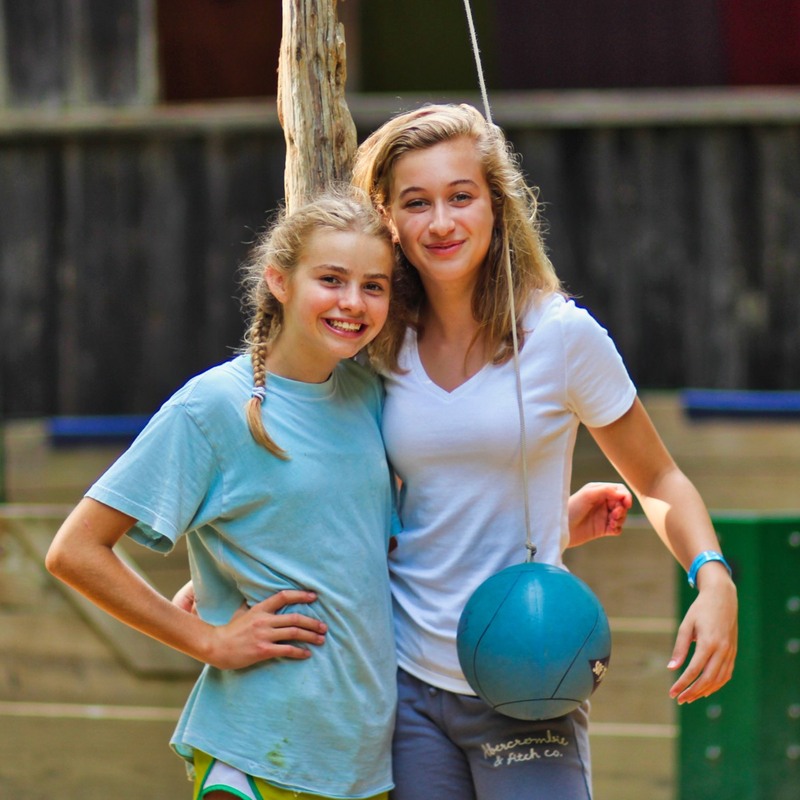 As you see your girls smiling and enjoying themselves doing any of the regular in-camp activities offered everyday at camp, at least part of that smile arises from the simple satisfaction, and maybe a little pride, that follows her successful experience of independence. And that’s pretty cool stuff. Stephanie Brown here! 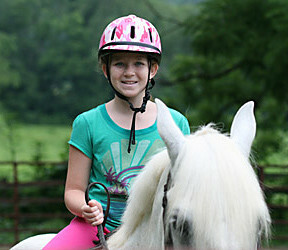 I am the middler line head and Rockbrook intern doing the blog post for today. As we woke up to the sound of the 8 o’clock morning bell, the air was crisp and the day looked promising as the fog cleared from a top Castle Rock. There were no Rockbrook surprises but it is days like these that girls seem to love the most. Zip lining was offered throughout all four periods and it filled up fast! 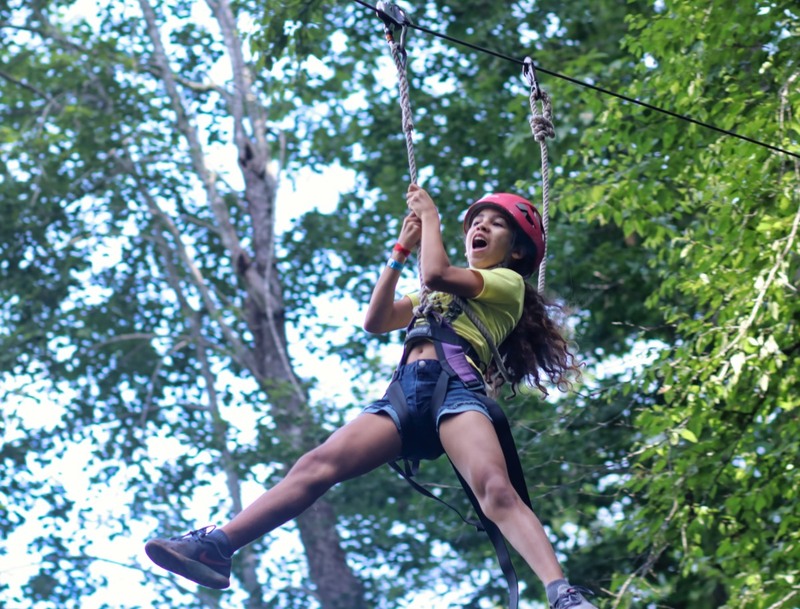 Girls love to yell, hold tight, or just let go when they go down the zip line – for some it is one of their favorite experiences at camp. Others had their daily scheduled 4 activities. A popular choice of activity is yoga. Here girls are able find a nice quiet time to relax from the hustle and bustle of camp. Mary Alice, the yoga instructor and middler cabin counselor, welcomes any experience level. It is held in the peaceful hillside lodge where, as campers practice, they can see a view of the hill, lake, and castle rock. Though the day had a regular schedule, somehow it was anything but regular. 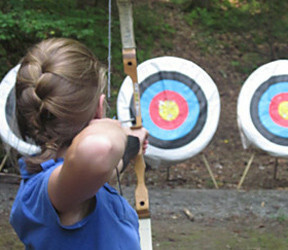 The campers got to choose how they would like to spend their free time. During these days, time almost stands still. We do not know what is happening anywhere except right where we are. 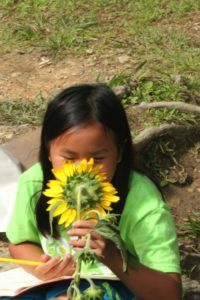 Campers have time to really “stop and smell the roses” with a short trip down to the garden. Whether it be in a cabin, outside on the hill, or at the garden a single conversation with a friend makes a friendship you have only had for a week feel like one you have had for years. A highlight of the day was the Dance Break at the lunch. A dance break is a prize that one can win on the Wheel in the dining hall. If you spin it you and your cabin choose a song that will be played during a meal unexpectedly. Everyone, and I mean everyone, gets out of their seat and starts to dance. If you haven’t read this post about the wheel, check it out! 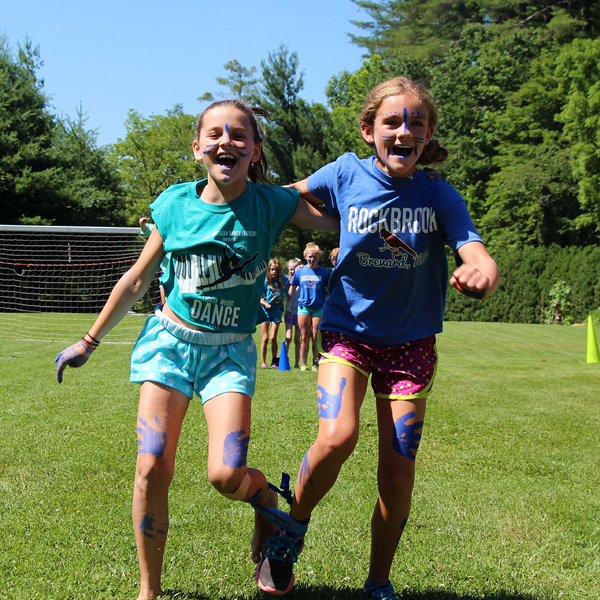 As Taylor Swift’s 22 came on over the speakers someone yelled, “dance break!” It was such an amazing moment to witness as it almost encapsulates camp life here at Rockbrook. Campers, counselors, directors, Taylor Swift fans, and non Taylor Swift fans alike were dancing around the dining hall with nothing holding them back. It is at the end of these days when we realize nothing is better than this. These little moments that make you smile and feel grateful, because you have been given an opportunity to have a regular day become most extraordinary.